An article in America: The Jesuit Review, by Theology Professor Jonathan Malesic, got me thinking about labor and a perspective on our daily work. In this day and age, it can be said that many are increasingly experiencing work as perhaps materially unrewarding and not fulfilling. In this day and age, in what is called the post-industrial era, many see their stability of a job, of work, as becoming rarer. This can lead to the thinking that work, a job, daily labor is irrelevant, even insignificant to one’s own worth and connection to God and His ongoing creativity in the world. As a Priest, I would like to contribute to connecting those who work, like me, to their own sense of fulfillment and spiritual commitment to God. Professor Malesic wrote about how, through our work, our labor, each of us can respond to “the universal call to holiness in everyday economic life.” I understand this to mean that all labor, every job, can be seen as a connection to God, to His creation and will for every one of us. I like to remind people that they must live (and work) their passion, what they really like and want out of life. Thus, I think that this “call to holiness” is about how we find stability in our work, in our jobs, so that we fulfill our hopes, dreams, and aspirations, making them a reality for ourselves and those we love. Now, I know there are many political and economic forces beyond one’s control that can dictate work and jobs in our community. Yet, what we do control, is how we work, how we perform our jobs, so as to fulfill our own being, our sense of self and self-worth. Perhaps this will bring each one of his to holiness. As a Priest, I am aware that I must help others to see the value of work; that it must not be overvalued or undervalued. Such a value, I believe, means that one must not “overwork;” that one must balance daily life with work and rest. So, let’s ask ourselves the questions: “How does my work and its task before me contribute to my progress toward holiness?” “How does my work and its tasks contribute to my sense of well-being and self-worth and to the life of the community and to others’ sense of well-being and self-worth and to the life of the community?” I’ve always had the thought, and I pray about it, that my work, my labor, my job, does make a difference and that others derive goodness (and holiness) from it. God’s creation is providential and God provides all that we need. Everything doesn’t have to be earned because God gives us, gifts us, with what we need. We are all in God’s creation and the thinking that one must “always work for everything,” points to a certain lack of understanding about our own status as creatures of God. I believe we can enjoy work or labor, yet we don’t have to work all the time. Rabbi Abraham Joshua Heschel echoes this idea in arguing for the Sabbath, “a day of rest” as “the heart of human existence.” He says that on the Sabbath, and at rest, the person “says farewell to manual work” and learns to understand that the world has already been created and will survive “without the help of human beings.” So balance your life with work and rest, with labor and recreation. If we consider that our ultimate destination as humans is a connection or communion with God, then Pieper’s thought that “rest from work” is a celebration of our existence, of life itself, is a necessary reality for those who work, who labor. If we do not “rest from work,” I believe, we make all our work, our labor, unfulfilling, unrewarding and, therefore, undervalued. As a Priest, I would like to tell you that the highest form of celebration is worship. Kababayan, can anyone argue against worship? Thus, I believe God blesses all our labor, our work and our rest. All of this contributes to our sense of wellbeing, self-esteem, and holiness, as creatures of a loving, merciful and providential God. Have an idea or a comment or even a question, contact me at this email address: atingkabuhayan@gmail.com Until next time, take care! 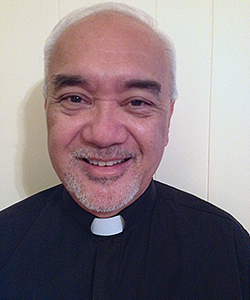 John A. Hau’oli Tomoso† is a Social Worker and Episcopal Priest. He is a Priest Associate at Good Shepherd Episcopal Church in Wailuku and an on-call Chaplain at Maui Memorial Medical Center. Tomoso was graduated from St. Anthony Jr./Sr. High School, the College of St. Thomas in St. Paul, Minnesota (Bachelor of Arts in Political Science and Sociology) and Myron B. Thompson School of Social Work at the University of Hawai’i at Mānoa (Masters of Social Work). In 2008, he retired from the civil service as the Maui County Executive on Aging. Tomoso is currently the Executive Director of the non-profit Tri-Isle Resource Conservation and Development Council, Inc. His wife Susan is a 7th grade Language Arts Teacher at Maui Waena Intermediate School.